The SEO world is fraught with people who claim to know SEO and will get you ranked #1 in Google if you only pay them a few hundred dollars. Many major websites, including BMW and J. C. Penney, have fallen victim to scams by SEO agencies. These agencies often use newfound black hat tactics to temporarily boost the rankings of these sites until Google catches on and blacklists these sites. 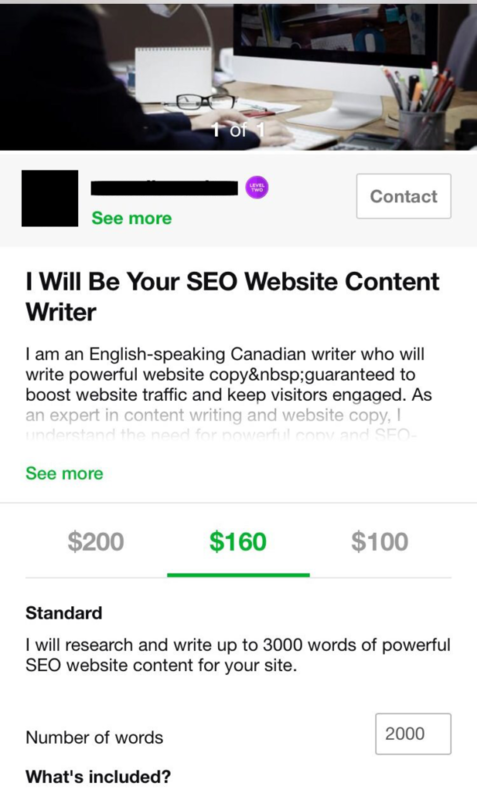 With the proliferation of work-from-home and freelancing jobs, there’s a new breed of SEO expert, the so-called “SEO Article Writer.” These SEO writers are all over job sites like Upwork and Fiverr usually charging anywhere from $5-500 per article. If you’ve thought about hiring or hired a website content writer who says they understand SEO article writing, we hope this article will help you evaluate whether the person you hire(d) actually knows SEO. 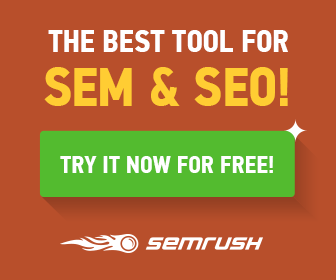 Learn how you can stop wasting money on so-called SEO writers below. What Are Bad SEO Strategies? Backlinks used to be the main way that Google evaluated how valuable your website was. The quality and quantity of the links used to be measured by PageRank, but as of 2013, PageRank was decommissioned by Google. Still, there are many SEO agencies and writers who will “guarantee quality backlinks.” What this really means is that the SEO agency or writer will pay a web directory owner to have a backlink to your website on the web directory. These web directories became so popular a decade ago, that they became known as link farms. During the last few years, Google has heavily penalized websites that rely on link farms for ranking. It is best to avoid SEO specialists who practice this kind of SEO tactic. Duplicate content is a major no-no in the SEO world and Google penalizes it heavily, but many so-called SEO specialists try to use the same content over and over again without letting Google know. This is done by “spinning content.” Content spinners are websites or tools that attempt to modify content by swapping words with their synonyms or changing the order of sentences. By doing so, the SEO specialist hopes to create multiple copies of the same content which all link to one “master article” that they are trying to get ranked. Spinning content becomes particularly nefarious when article writers simply copy someone else’s work, run it through a content spinner, and then try to sell it to you as original content. Often this content is difficult to discern as plagiarism to humans, but Google has developed sophisticated algorithms (and bought some content spinning websites) to counter spun content. Link spammers will typically post links a website on all sorts of online forums. From other blogs to Reddit, the goal of these so-called SEO specialists is to get your link plastered on as many pages as possible to build up backlinks. 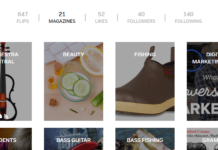 Of course, many of these websites won’t even align with your blog or website’s topic. Of course, Google and other search engines few this kind of marketing as spammy. Just like link farms above, link spamming could severely impact your rankings in Google. The final bad SEO strategy we’ll cover is called “keyword stuffing.” While using keywords in your articles is still a valid and critical SEO strategy, the practice of stuffing as many keywords as possible into your articles is bad practice. 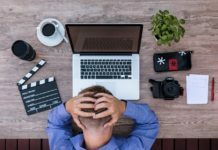 Before we get to what you should look for in an SEO writer, let’s discuss a few red flags that you can use to identify bad SEO writers. Most SEO specialists “guarantee” that they will boost your website traffic. Since Google is constantly changing its algorithm, there is no way any SEO specialist can guarantee higher rankings or more traffic. This is a tricky one. Sometimes SEO specialists will try to attract customers by offering extremely low prices ($5/article or similar) which probably means they are just spinning someone else’s content and then keyword stuffing the article. On the other hand, higher-priced SEO writers might simply outsource the article creation to some foreign writer for a much lower price and then take the margin between what they charged you and what they paid the foreign writer. This is a tell-tale sign of spun content. If you notice words that typically wouldn’t be used in a sentence throughout the article that means the same thing as another word that should be there, then the article is likely spun and thus plagiarized. You can use tools such as Grammarly, Copyscape, or Quetext to identify plagiarized content. Another sign that you’re writer really doesn’t know SEO is that they use keywords many times throughout the article, even if the sentences don’t make sense with those keywords. This is a sign of keyword stuffing as defined above. Hopefully, you now know a few things to watch out for when hiring SEO article writers. Next, we’ll tell you about three things that any SEO writer will know and that you can use to test whether the SEO writer you hired actually knows the skills that they’re selling. There are a lot of factors that affect SEO and rankings, but there are a few things that any SEO writer will know and you can evaluate their work based on whether they consider these three key things. If your SEO article writer does not follow these three things, they probably do not know much about SEO. Historically, the internet was peppered with 500-word articles that ranked well. Content creators could churn out short-form articles quickly and rank well for a lot of different keywords. That has since changed and Google now favors longer form content. Buffer states that the ideal blog post length nowadays is at least 1,600 words long and Medium has found similar results. We have found that anything over 1,000 words tends to rank well, especially in low-competition keywords, but the closer we are to 2,000 words, the better. If your SEO writer, unprompted, gives you back an article that is less than 1,000 words, you can be assured that the writer really doesn’t know SEO. While your writer shouldn’t be keyword stuffing, they should still be using keywords strategically throughout the articles they write for you. 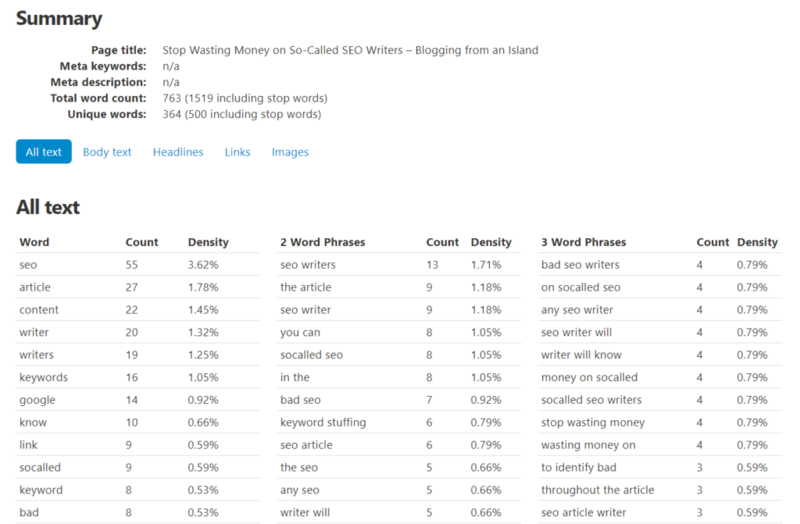 If you use the Yoast SEO Plugin for WordPress, it will recommend similar placements of keywords. The first place keywords should appear is in the H1 tag of the webpage. This is the major headline of the article. For example, if you view the source of this article right now and search for “<h1” without the quotes, you will notice our H1 tag is “Stop Wasting Money on So-Called SEO Writers.” The keyword we were going for in this article is “SEO writers” so we made sure that it appeared in the headline. The next place your writer should include the keywords is in the first paragraph of your article. You’ll notice that we also included “SEO writers” in our first paragraph. Google tends to look in the first paragraph for any keywords that might describe what the article is about, so the best way to rank well for your given blog topic is to include the keywords you want to rank for in the first paragraph. Finally, the keywords should be used multiple times (at least 5) throughout the article in places that make sense. 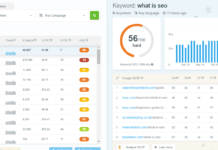 You can do a simple “Find in Page” search to count how many times your SEO writer has included the keywords, but you can also use a free keyword density tool to check for the most frequently used phrases in the article. Both backlinks and internal links are still important these days so your SEO writer should still include internal links whenever possible within articles they write. If they mention something in an article that was already elaborated upon in another article, they should absolutely include a link back to that previous article. While SEO writers shouldn’t go out of their way to include internal links, Google values links to relevant content that will enhance a reader’s experience. You should be wary of SEO writers who try to include internal includes every few sentences. Including internal links too frequently can often signal to Google that you are intentionally trying to beat the ranking algorithms, so make sure your SEO writer uses discretion when including internal links. Next articleHow long does it take to get ranked by Google?